How can we resist a visit to a place called Deception Pass? We can’t. We dedicate this hike to our niece Tara who told us, You will love Deception Pass! On this dazzling early June day, Hannah and I have come 70 miles north of Seattle to hike the seaside trails at Deception Pass State Park; it is located on Fidalgo and Whidbey Islands on Skagit Bay. Hannah and I have some ancient history on these islands. You see 38 years ago this month, Hannah and I drove with her brother Doug and his then girlfriend Debbie 1500 miles from Tempe, AZ to Whidbey Island. They had plans to spend the summer biking down the Pacific coast from Washington to California, then across the Mohave Desert back to Tempe in the Phoenix area. I’m not sure how well that last leg of the trip was thought out. Taking four to five days to arrive in the Northwest in Doug’s Econoline Van, we four camped at Whidbey Island before they set off biking and we drove the van home to Tempe. Unbeknownst to us that night, there is Naval Air Station on the island, which periodically runs night missions with their jets. And this was such a night. It was like a freight train barreling through our tents. By 330A Doug had had enough, got up, and drove to the naval station to give them a piece of his mind. It did not go well. The Navy said in so many words, Really? We are the US Navy. We are protecting, among your rights, your right to camp. By dawn they stopped and we got a good three hours of sleep. Now 38 years later we return to Whidbey Island. Today, using Everett, WA as our home base, we drive north on I-5, then turn west at Mount Vernon on route 20 to Deception Pass State Park. Click here to get detailed description of hiking on Fidalgo Island at Deception Pass State Park. After five days of hiking in the Cascade Mountains of Washington, we are ready for some mellow seaside hiking and climbing. Chatting up the campground host, we learn that we’ll hike trails on Fidalgo Island and then drive over the twin bridges to Whidbey Island itself to hike some more. The evergreenness of Washington is again evident as we take to the beach trail before climbing into the hills above Bowman Bay. In minutes we could be on a mountain in Washington’s Cascades, but we are always just a few minutes from Skagit Bay. The trail climbs to a lookout facing towards the Pacific. Warned that further hiking on this loop will take us on a “goat trail,” we poo poo the notion that we are not up for such a challenge. Soon we are laboring, plodding along the steep mountainside, scrambling through the thick underbrush, and very soon doubling back with egg on our faces. After lunch, we drive across the twin bridges over a strait from Fidalgo Island to Whidbey Island. Straddling the twin bridges, Deception Pass State Park with its campgrounds, beaches, and tide pools is the most visited state park in all of Washington. At the trailhead with very limited parking, we prepare for the popular Goose Rocks hike. There we see the sign describing how Deception Pass got its name. To the north of this narrow passage is Fidalgo Island, so named for the Spanish explorer Salvador Fidalgo. To the south is Whidbey Island, second largest island in the contiguous 48 states, which Captain George Vancouver, while exploring this region in 1792, at first thought to be a peninsula. Further exploration conducted by him disclosed the existence of this intricate channel. Upon the realization that he had been deceived as to the character of the large island, Vancouver gave to this channel the name of Deception Passage. In naming the Island he honored his trusted officer, Joseph Whidbey. Climbing the half mile to Goose Rock summit, we are in minutes into the forest on a trail of hard packed dirt. The contrast with our river/waterfall hiking of the past days complements our Northwest hiking experience. Fortunately, on this first Friday of June, when we are heading back againist traffic to Everett, WA, everyone else in the Free World is heading out for a weekend getaway. PS The same day this blog was originally posted, a loyal reader received this picture taken from the twin bridges of Deception Pass. Enjoy. To avoid the snarling commuter traffic of Seattle to our south, we have set up shop in Everett as the base of operations for our hiking days this first week of June. Not until this fifth day of our hiking vacation in Washington do we finally get a dose of Northwest reality (i.e.,gray on gray with rain here, there, and everywhere). Until today it’s been Leslie Gore weather (i.e., sunshine, lollipops, and rainbows). Click here to hear the Jersey Girl sing that classic 60s pop ditty. Under low clouds we drive even further north on I-5 for 20 miles and then 23 miles to the east on route 530 through Arlingt0n and Oso. Turning off the highway on to French Creek Road, we are promised 3.6 miles on a “good” dirt road to the Boulder River trailhead. Very quickly, we beg to differ about said “good” road. Indeed, we feel we have been hoodwinked! Click here for the Washington Trails Association description of the Boulder River Trail. The only way that this is a “good” road is if you are driving an ATV, 4-Wheel drive, or some Monster truck! Weaving in and out, past and through cavernous potholes filled with water from the overnight rain, we have one other slight problem – it’s a one lane forest road with absolutely no shoulder. We have no idea how far we might have to back up if we meet another vehicle. But please! Who but us would be hiking on such a day! French Creek Road reminds me of Forest Road 42, another detestable backroad to Springer Mountain in Georgia (the southern terminus of the Appalachian Trail) with its harrowing turns on mountainside cliffs. Three point six miles in 30 minutes! French Creek Road after a storm is our new least favorite road in America. Hannah, who later drives out, says because of this road, she would never recommend this Boulder River hike, even with its 200+ waterfalls. Me? I am still on board with this being a cool hike. Drive two mph when appropriate and you’ll be just fine. Expecting empty trailhead parking, we are surprised to see a bus and another car on this soggy Thursday. It’s a hiking morning that might cause one to wonder, What the hell are you two doing hiking in this weather? What are you smoking? Do you two ever take a day off? The short answer is, Not in recent memory. You see, we only have ten hiking days 3000 miles from home in Maine and today have spent ninety minutes getting here; ergo, ipso facto, I pull on my evergreen Washington poncho while Hannah slips on her rust orange designer rain jacket. At the start, the trail is 8’ wide and level, allowing us to walk side by side. Soon to our right, some 200 yards away, is the Boulder River Falls. Though we can hear the falls, we cannot see it through the foliage. We read that from this trail there is no access to the river below. Heading inland along the Boulder River, we hike high above it on a rocky and rooted mountainside trail. This is no trail for kids under eight and as such not a family hike. But is it ever lush with spring green ferns, nearly ripe raspberry bushes in this old growth forest. We’ve read that there is an old growth hugging tree. Huggers from way back, we are zeroed in on finding this tree! Within 30 minutes, we first hear, then see the unnamed twin waterfalls spilling over the mountainside down to the Boulder River. The 200’ drop is spectacular as it brightens the still misty 52F late spring morning. The following video is our first pass of these spectacular falls. On the trail by ourselves, we have ups and downs along the river mountain side as we climb through thick Washington greenness. For the first time in a week I don’t even notice my left Achilles; just a week ago I pissed it off by playing ping pong barefooted and put our hiking trip in jeopardy. Eventually coming to a group of teenagers, we chat up the chaperones and teachers and learn that these 10-16 year olds are from the local Montessori School. Click here for more information about the Montessori Schools of Snohomish County. Hearing Montessori, I jump to the conclusion, as I am want to do, that these must be really cool teachers with students whose parents want something more than being homogenized by the whole milk of standardized testing. Later checking their website, I learn, Through the use of the five senses and manipulative (hands-on) materials, the child is allowed to progress at his/her own, individual learning rate. How cool is that! Twenty-five minutes later we come to a second falls that we see through the trees high above the Boulder River. The trail remains very rocky and rooted, but that gives it character as the sun emerges from behind the less dreary Washington sky. Upon our return, Hannah in the lead spots and hugs the Hugging Tree. Old Growth Love at its best. As her Old Growth Love, I have had the good fortune to go from Hannah’s Young Growth to Old Growth Love over our 44 years together. Our four-year-old grandson Owen wonders why he never sees his Poppa in the hiking videos. Well, today I’ll provide the commentary while Hannah shoots the video from my iPhone. And to top it off, we have named the unnamed waterfalls. Take a listen and enjoy the afternoon video of the twin falls. After hiking the waterfalls trails of Mount Rainier National Park this first Tuesday in June afternoon, we see that the WAZE GPS on my iPhone indicates we have 2+ hours of driving to our Comfort Inn and Suites in Everett, WA, north of Seattle. Of course we are dreaming if we think we are getting through Seattle during the evening rush hour without paying a price. Seattle is big time. Oh, except v. the New England Patriots! Ba-da-boom! Of course, Los Angeles, San Francisco, and Washington, DC have horrible traffic. But today Seattle is holding its own at rush hour. Driving north on the I-405, we are three lanes of dreadlock with two HOV lanes racing by us. You see in Seattle, the HOV lanes often come with a price. Today it is $7.50 for the pleasure of whisking by us, the masses swamped in traffic. Such a monetary incentive helps with the traffic for the well-to-do. Today we are the well-to-don’t. Finally enduring an hour of stop and no go, we arrive at our motel in Everett, WA, making it our base of operations for the next four days. It’s an ideal location as we seek out waterfalls in the mountains to the east and trails in the islands of Puget Sound to the north. At the same time, we will avoid the traffic congestion of the Seattle metro area by hiking north of the city. Today we head out route 2 through the small towns of Monroe, Sultan, and Startup to our destination in Gold Bar, the home of the Wallace Falls State Park. Widely known in this part of the country, Wallace Falls has three dramatic falls, Lower, Middle, and Upper that are among the most popular in the state. It’s the first week of June so we find the parking lot 20% full. This would not be the case on the weekends in the summer. Mob city is what we hear. Paying $10 to the state of Washington gives us the golden opportunity to hike the trails past these falls. Our hike begins on a wide hard packed gravelly trail under massive high tension towers. But that’s only for a few hundred yards before we turn left into the forest on the Woody Trail. It is the evergreen of this Evergreen State. The massive cedars, the spring green rampant ferns, and the well maintained trails give off a Disney vibe, in all the best sense of the word: well-cared for, organized, and prepared for visitors. The lushness distracts us from the 1300’ of elevation gain that we will have over the next three miles. With three previous days of hiking in Washington State in the books, I continue to ice my left Achilles and do the stair exercises to strengthen it. Though Hannah hikes ahead, no longer does my Achilles feel tender; I just know it’s there. The trail is usually hard-packed dirt but with the constant climb, we step over and on rocks and roots in the trail. No lie, it’s a workout, but one with a big payoff. With the sound of crashing water in the distance, we come upon the first of three dramatic falls, the Lower Falls. With our grandson Owen’s Woodstock and Max’s Blue Elephant along for the hike, we have the joy of the Lower Falls to share with them. Though we are joined by families and college kids in groups, we are never slowed in our climb up and feel the joyous nature of hikers knowing how fortunate they are. Heading up the mountainside of Mount Stickney, we arrive at the fencing at the overlook to the thundering Middle Falls. The climb is relentless, there is no getting around the 1300’ of elevation gain. Stepping over and on stones and roots, we can just imagine how busy these trails are on the weekends. We celebrate with a pear and oranges upon our arrival at the Upper Falls. The well-maintained part of the trail ends at this point as we follow the blue blazes of the rougher, steep trail further up the mountain to the railroad trail. There we have a 100 yard walk to the bridge across the falling Wallace River. Beyond is a sign saying that you are leaving Wallace Falls State Park and with no longer any trail maintenance. Heading back to the trailhead, we have no interest in bushwhacking, as we have taken 90 minutes to get to this point. On our descent, we wonder how this hike is only rated 4.05 out of 5. It is stunning and worth the trip from Seattle, as long as you avoid the weekends. It’s a 5.0 of 5! Absolutely! Click here for more details of the Wallace Falls trail. It all began quite innocently. I play ping pong each Thursday afternoon with my buddy George Derby; we’ve played weekly for the last five years since I retired from the University of New England. Here’s the scene. It’s a warm late May day; I am in bare feet to keep cool and be light on my feet. An hour into our games, I feel a small ache in my left heel, but play on. Later, after sitting over Red Hook beers, I have to limp to make it to and from the kitchen. While I’m sitting, I twist my ankle up and down, then side to side to keep it loose. Overnight, I sleep restlessly, even putting a pillow under my left foot to elevate it for some relief. Nothing’s working. You see, the timing of my aching heel is not good at all. 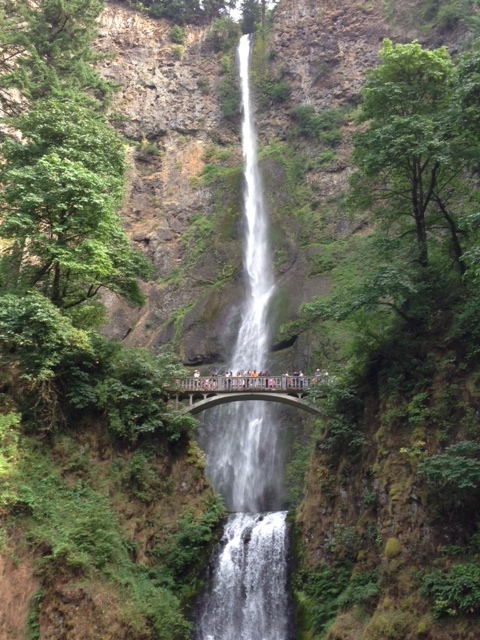 Hannah and I fly to Portland, Oregon in two days to hike the waterfall trails in the Northwest. As I awake Friday morning, there is no way I can hike. Postpone the trip? Why go on a hiking trip if I can’t hike? Though we’d be charged $150 each by Jet Blue to change our tickets, postponing would save the $530 rental car fee and multiple nights in motels. Fortunately, I have a “go to” friend/physical therapist Corky Thomson to consult. Having been there for my stiff neck and pickleball elbow, she is the one I text at 515A, the day before we are to leave, to see if she has a few minutes to see me. Fortunately, she does. Once we get together, Corky tests my ankle to see if I have torn my Achilles tendon. Fortunately it appears that I’ve just strained and inflamed it. Recommending ice, 20 minutes on and 20 minutes off all day, she also offers me her favorite Achilles stretching exercise (see its description at the end of the blog) and sends me on my way. Like past minor aches and pains, this Achilles issue is just another symptom of a 68-year body naturally breaking down over time. It’s no mystery that a lifetime of exercising, thirty years of running, and living the outdoor life may have caused me a few physical problems. Thankfully, stretching to attend to my flexibility can keep me in the game. Oh, and one more thing, Corky adds, No more playing in bare feet. You need the support of sandals or shoes. Highly motivated with our departure just a day away, I ice religiously and stretch my Achilles. By late in the day I feel 80% and am stunned how good I feel. Taking nothing for granted, I ice and stretch throughout Saturday, prior to our evening Jet Blue flight to Portland. At Boston’s Logan Airport, I gingerly walk the wide corridors looking for a place that just might fill my Ziploc bag with some ice. Bingo! Camden food co. comes through in the clutch. The smiling clerk takes my Ziploc bag and fills it with three trays of ice. Right there in the waiting area, I ice off and on for the next 90 minutes. I have no shame. Later, during the six-hour flight to the West Coast, I ice my left Achilles at my aisle seat a good five times more. My seatmates act like this is all perfectly normal. I am not. Corrie, Karl, and Hannah. Corrie holds a Hannah’s Loft cream pitcher from the circa 1986-1991 when Hannah was a B&B innkeeper. Hannah holds a mug crafted by our son Will. Once in the Beaver State, we stay at our niece Corrie’s and nephew Karl’s place in nearby Beaverton (home to Nike). As you may guess, they welcome us, well, like family! A morning of coffee and oatmeal on their back deck sets us up for driving an hour to the northeast past Battle Ground, Washington for the trailhead of Moulton Falls. With Day Hikes – Columbia River Gorge by Craig Romano (2011) as a guide, we have clear directions and a map for the perfect hike for me; a five-mile round-trip along the East Fork of the Lewis River (yes, that Lewis of Meriwether Lewis and William Clark fame) on a gently inclining terrain with no more than a 260’ of elevation gain. Icing my Achilles twice while Hannah drives to the Moulton Falls trailhead, I am ready for the first 0.6 of a mile of the wide, paved trail with kids rolling by on bikes. With the East Fork to our left, my pace is slower than usual but steady nonetheless with only minor discomfort. Sweetly, Hannah slows so we can walk together. Soon the 20’ wide trail, filled with families on this Memorial Day Sunday, turns to hard packed gravel, which is still excellent for bicyclists and easy on this Mainer’s Achilles. High above the rapids, we see riverside cabins on the opposite side as we look forward to getting down to the white water of the rocky Lewis River. A little over two miles in, we arrive at the trestle bridge spanning the river chasm. Crossing over, we head back down the opposite side of the East Fork for the Moulton Falls itself. As one might expect on a Memorial Day Sunday, families are smiling and loving life on a 67F afternoon in rural Washington, just 40 miles from Portland, Oregon. With some modest rock scrambling, we position ourselves for one of my favorite couple photos. The Achilles, though slightly sensitive with each step, is safely protected with three socks in my hiking boot; it’s been a good choice to river walk rather than to be climbing a mountain. With a simple downhill 2.5 miles back to the trailhead, we have a river trail to ease the ever present sensation in my heel. At the car, I deboot and desock, and then ice my foot as Hannah does the Columbus thing – she drives west to I-5 to eventually go east on route 12 to Packwood, WA, the gateway to Mount Rainier. We all have angels in our lives. Our hiking on this first day in the Northwest is happening thanks to today’s angel – Corky Thomson. On our way to Packwood, we can’t help but smile at this coffee shop. Achilles exercise. Stand on a stairway riser as if climbing up. With toes pointing straight ahead, comfortably positioned, let the heel drop until you can feel the stretch. The beauty of the exercise is as you dip for a minute, you have the gravity of your full body weight to make the stretch a good one. Dip for a minute five times, three times per day. For me, it will be a lifetime of such stretching. You see, I want to stay in the game.